If it’s a matter of life and death, you want all factors counting in your favor. That’s only one reason to consider FLIR’s high end thermal imaging equipment ranges when it comes to upgrading firefighting equipment. The company’s list of thermal imaging products - and the unique ways in which the company incorporates this technology in tools - is noteworthy. 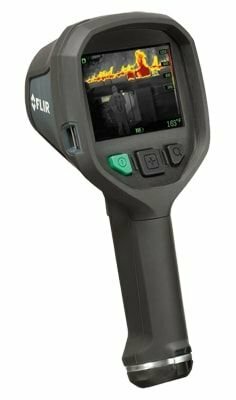 But, there are many options on the market and FLIR also offers lower end models in its range for those who have budget constraints. Which to pick? We reviewed the FLIR K55 to see whether this is what firefighters will put at the top of their wish lists from now on. FLIR - Who Are They? It’s best to know where your equipment comes from as you may need a manufacturer’s support or accessories in future. FLIR doesn’t disappoint as it has a good reputation and can be seen as a market leader. First off, it’s impressive that FLIR is a global company. People across the globe trusts its equipment to identify danger spots and high temperature zones. This data can effectively be used in decision making. While this has definite value for firefighters, the technology also comes in handy in other applications. Heat spots can show problems in a new building or even inside a vehicle. FLIR harnesses this power in its range of thermal imaging cameras. They proudly proclaim that they make it possible to utilize sensing solutions in every day life. Apart from thermal imaging they’re also invested in video analytics, diagnostics and threat detection systems. This makes it possible to obtain a range of innovative gear of high quality from one vendor. They also sell accessories, which can make your products even more user friendly. Their focus is assisting in improving public safety. Their equipment can be used to have a healthy, intelligent community in your area, whether FLIR’s products are used by professionals or the public. All you need to do is pick the right tools from FLIR’s range. Is the K55 one of them? Operating range: +302°F for up to 15 min; +500°F for up to 5 min. NFPA specifications: Meets NFPA 1801 specs for vibration, impact acceleration, heat resistance, product label durability. It stands out among its competitors, especially because of its great image quality. The FLIR K55 is an uncooled microbolometer with an FPA (Focal Plane Array) type detector. It’s been around for +/- 3 years. One of the main features that sets this apart from the other models in this range is the screen resolution. You’ll have a much better chance of making the right informed decision when you view on a 320x240 pixel screen, compared to others. When a firefighter is in a low visibility situation, that alone justifies the higher price tag. The conveniently large LCD screen is back lit which makes for clearer viewing even in low light or smoky conditions. A feature that may seem irrelevant, but is vital in the heat of the moment, is its start up time. You’ll have to wait at least 17 seconds before an image appears on the screen. This is important for the user: Switch it on well in advance so it’s ready to supply you with information when you need it most. An alternative is to keep it on Sleep mode as the start up time will only be 4 seconds then. One of the features that sets this apart from similar, but less expensive, FLIR models is that the K55 can provide and store video files. The zoom feature helps you capture the details you need. It’s quite impressive in this task as you can store up to 200 files at any time. These can be up to 5 minutes in duration. That’s more than enough storage for what it’s designed for, but it means firefighters don’t have to download the data every single time. When you’ve had a hectic day or you’re rushing to a new emergency scene, you’ll be thankful for this tech. Once it’s time to put together reports this can easily be added by downloading it via USB. On a hectic day you’ll also be thankful for the relatively short charging time. You can power it up to 85% battery life in two hours. If you don’t have that much time available, at least the LED lights will help you gauge how long you’ll have before the battery dies again. Once again, these small details make it even more appropriate for its application. It’s appropriately durable even for heavy duty use, as it’s made of flame resistant material and contains a magnesium alloy. This in part is why it can survive a 6.6ft drop, even onto a concrete floor. The simple three button control setup makes for easy use, even if you’re wearing gloves. It’s wise to trust market leaders when you’re kitting out professionals for a very important, dangerous job. In that scenario it makes sense to add this to a firefighter’s kit. However, this is one of FLIR’s more expensive options - the priciest in this range - which may put off private users. For domestic use, or if you’re not going to use this on a daily basis, other brands providing similar features in a lower price range may suffice. With that said, there’s no question that the FLIR K55 is a quality TIC. It’s also comforting to know that there are companies who make sure technology in the right form reaches those that are supposed to keep us safe.